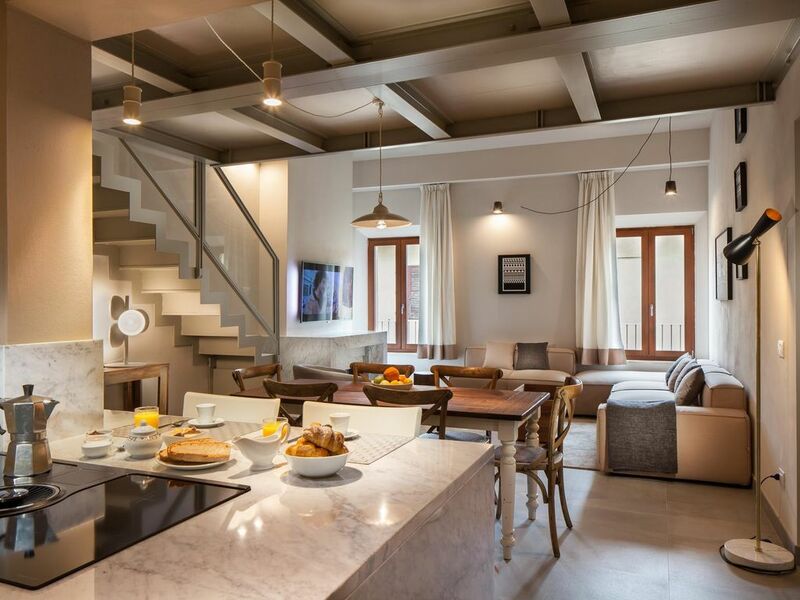 Nestled within a centuries-old building protected as a UNESCO World Heritage site, our luxury penthouse rises above the city’s medieval streets in the heart of Siena, just 200 meters from the Piazza del Campo. Our penthouse is on the top floor and features all the modern amenities including a full-sized elevator, a full-sized gourmet kitchen, and central air-conditioning; all rarities in Siena. With an elevator you won’t be stuck carrying luggage up multiple flights of stairs! The kitchen, finished with local Italian Carrara marble counters, is open to the living area which serves as the social center of the penthouse and is fully stocked including a dishwasher and a wine refrigerator to store the spoils from your excursions into wine country. Ask us about hosting an Italian cooking class right in the comfort of our home! Other luxury amenities include heated and cooled floors, a steam shower, a gas fireplace for those cool winter nights, high-speed internet and Sky satellite TV including English news and sports. The master bedroom features an ensuite bathroom with a steam shower and the villa includes a full-sized washer and dryer. The home can comfortably accommodate two couples or two families with sleeping for up to eight including a master bedroom, secondary master bedroom, bunkroom and loft. The entire home is on one floor with no stairs to climb aside from the loft. Step outside your door and experience Siena as it has been enjoyed for centuries - by walking to the historical buildings and churches where Michelangelo, Bernini, and Donatello left their masterpieces. Experience what it is like to live in a medieval walled city and enjoy decadent meals at authentic restaurants and cafés or pamper yourself with a day at the local spa. Siena is the perfect launching point for excursions into the Tuscan countryside famed for its food and wine. Whether you are horseback riding, hiking or mountain biking in the rolling hills or enjoying a more leisurely wine tour, you’ll fall in love with the beauty of the Tuscan countryside. True luxury in the heart of Siena! This property is impeccable! The owners thought about every detail in this remodel. Not to mention, the location walking distance to Piazza del Campo which is historical and beautiful. The local property manager, Giada, recommended some great restaurants (one which her boyfriend is the Chef at) and planned our wine tasting after in Tuscany. Wow!!! Had a lovely stay in this apartment in Siena. It has a great location within the heart of Siena, and is modern and includes great amenities like washer/dryer, air conditioning, wifi, etc. Was a perfect place for seven of us to stay during our travels around Siena. I would highly recommend this property. Thank you for an amazing apartment in your fabulous city! We spent a week at this gorgeous apartment and are absolutely happy about our decision to rent this place. The apartment is better appointed than a luxury hotel, is modern, and has everything you need to spend a week in comfort and luxury. I forgot my plug adapter at home and even found an American to Italian plug adapter there! Our research brought us here because we could not find this modern aesthetic anywhere else in the old town of Siena. We loved the steam showers, the heating and cooling system, the modern furniture and a wine fridge in the kitchen. The apartment became a sanctuary to go back to after a day of exploring Tuscany. We hosted a dinner party with a private chef invited from a local restaurant. Not only we had enough room in the kitchen to accommodate a team of 4 people from the restaurant, we had enough seats at the table in the living room to enjoy dinner for 8. The apartment is located steps to Piazza del Campo, shopping, old churches, museums, Duomo, restaurants, etc. It's literally in the heart of the old town. We took trips to Tuscany countryside and came back happy. We will be back! Our penthouse, nestled within century-old building protected as a UNESCO World Heritage site, rises above the city’s medieval streets, its modern luxury a welcome sight for travelers. You can start experiencing Siena by walking to the historical buildings and churches where Michelangelo, Bernini, and Donatello left their masterpieces. Head out of the city to the Tuscan countryside famed for its food and wine. Experience the finest Italian cuisine while taking cooking classes in Siena, or invite a private chef to your villa and have a dinner served to you at the penthouse or even pamper yourself with a day at the local spa. In the summer, catch the famous Palio Festival taking place right in the city center. The possibilities are endless when you travel with Equity Residences.